Our beginnings trace back to Mike Temple’s Berkeley garage in 1975, where he and a group of self-professed “food and wine geeks” with a tasting club stored their wine and met regularly to drink it. Within months Mike and his friends went “deep” and began purchasing wine at auction in England. Such activity required an import license – After several years and many bottles of Grand Cru Burgundy the group became official by incorporating in 1977. Players in the then emerging Berkeley farm-to-table restaurant scene wanted “in,” as there were precious few quality minded wine importers operating in California at this time. A company was born. In 1987 President Alan Pricco joined Grape, providing the additional capital and energy to expand the company’s distribution into Oregon and Washington. 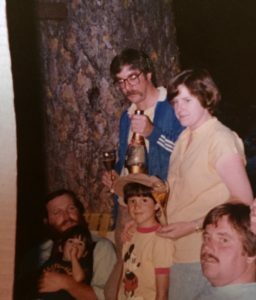 By the late 1980’s Mike and Alan had salespeople and trucks covering the coast from Los Angeles all the way to Seattle, establishing early leadership when it came to integrated multi-state wine importation and distribution. Netherlands-based Frank Poot, a long time industry leader in Europe, joined Grape in 2015 after the untimely passing of Founder Mike Temple. Mike and Frank, always close friends, collaborated on many fronts over the years and Frank’s formal integration into the company now provides Grape with a stronger than ever foundation in Europe. Frank’s extensive relationships and logistics acumen are second to nobody in this business. Our National Portfolio represents independent producers from all major wine regions with licensing and service in all 50 US states. Our West Coast Distribution arm directly services the Western states of California, Oregon, and Washington through a staff of 52 team members, selling both our own import selections, wines from partner importers, and wines from leading domestic producers. Here in the US market Grape is unique amongst peers of similar size and longevity in that the company has remained a family oriented operation through and through. Most of the key members of our management team have been with us since the first time neon colors were in style, and the second generation of the family is now stepping into leadership roles. More so than any of his Bay Area peers our late Founder Mike Temple placed tremendous emphasis on delivering value, and forty years later it goes without saying that most everyone in this industry thinks of “Grape” and “value” synonymously. Whether dealing in humble Touraine Sauvignon or Cru Barolo, Mike took heartfelt pride in providing unbeatable value to you, Grape’s clients. Our industry is changing quickly these days, and we’ve doubled down on Mike’s legacy of value with the rollout of our National Portfolio and its “winery direct” pricing model – We don’t build a typical importer margin into our national prices because we don’t have to. We don’t employ the typical importer’s army of regional managers, you won’t see us spending money on in-store demos, we refuse to pay slotting fees, and we don’t shuffle our import employees across the country on time and dollar consuming “ride withs.” Instead we drive engagement through our best-in-class online platform and through personal visits from winery principals. A similar story can be told about our West Coast Distribution arm and the uniquely low cost structure that now serves as its architecture – No layers of middle management, no army of merchandisers, and no fancy office spaces…Just hand-made wine sold at prices that induce eye-strain! Wine lovers everywhere seek out the “Grape” importer label because the’ve come to trust our company’s ability to consistently over-deliver. The continuation and expansion of this philosophy, Mike’s legacy, is our obsession.